The first of these recordings was originally made and issued in the 1990s, and has been re-released by Skarbo, which is welcome news. The second is a newer recording, and "replaces" an earlier Skarbo CD reviewed here in 2001, with the same pianist and some of the same works. 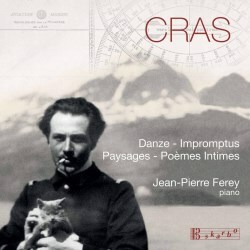 Jean Cras was a contemporary of Debussy and Ravel and had a sea-faring career. He ended up as rear admiral and commander-in-chief of the French Navy in Brest. This enabled him to travel to exotic climes and encounter many foreign cultures. These influences found their way into his music. His scores are flavoured by the Orient and steeped in rarefied harmonies and myriad hues, recalling Ravel. Yet, all the while, he never forgot his origins, and the folk music of the Breton region is also a compelling feature. The Suite in Duet is found more often in its original guise as a four-movement work for flute and harp. Here we encounter it in the violin and piano version. From the opening Préambule the work is sun-drenched and optimistic. The second movement has a jaunty folk-inflected dance rhythm. Then comes a chirpy dialogue, followed by a finale of heart-warming lyricism. Cras's melodic gifts are also evident in the Four Pieces. The first is an Air and Variations, with a theme of affectionate warmth. A delightful Habanera precedes Evocations, an exotic morsel. Eglogue is more serious and progresses in courtly manner. Nicolas and Ferey deliver flexible performances adjusting to the changing moods of the music. Precision of ensemble with attention to detail and phrasing is another strong positive. Intimate Poems are five pieces, composed early on in his career between 1902-1910. 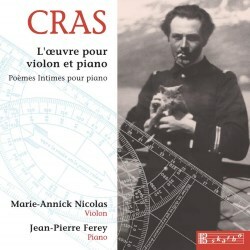 The composer draws inspiration from nature, occasionally flecking the music with folk elements They display a more than competent pianistic fluidity and Jean-Pierre Ferey's idiomatic readings and colour range, in both recordings, prove him to be a worthy advocate. In the 2015 recording he only offers three of the pieces, sadly omitting Au fil de l’eau, my particular favourite. Dances, from 1917, is an ambitious work on a grand scale. The title belies its sheer range and scope. Danza Morbida, the opener, is the longest piece at 10:26. It begins and ends with a sombre, melancholic elegy, characterised by a tolling bell-like accompaniment. A contrasting central section is passionate and rhapsodic. Danza Scherzosa is capricious and mercurial, whilst Danza Tenera is wistful and tender. The cycle ends with Danza Animata, a high-spirited romp. The two Landscapes present cameos, one an impressionistic seascape, the other a scene of rustic jollity. The Two Impromptus were originally written for harp. The first, for me, recalls glistening raindrops, whilst the second, likewise, makes play with luminous sonorities. Once again, Ferey steps up to the mark admirably.